One of the advantages of using cards is that you are forced to be very concise about what you write. Each card must describe a single topic; there is not enough space for more than one or two sentences. This is good, because if forces you to divide everything into the smallest units. If what you are writing doesn’t fit well in a card, it means that you have to split it into two different messages. Another nice thing about using cards to plan workflows, is that you can easily move cards from one list to another. For example, at a certain point I noticed that I had to dedicate more time to explain the Unix manual and how to get documentation; so I had to move some of the topics to the afternoon, by moving the cards though the list. This is something quite easy to do if you are using cards; but if I was doing the planning on a normal A4 paper, I would have been forced to rewrite everything from the beginning. Cards are a very flexible tool. So, if you are looking for a tool to organize your workflows, have a look at trello or at the Kanban methodology. Cards are a cool: and there are really a lot of ways to use them, from taking notes during a seminar, to plan your day schedule, to organize your PhD project. A nice way to use Trello! 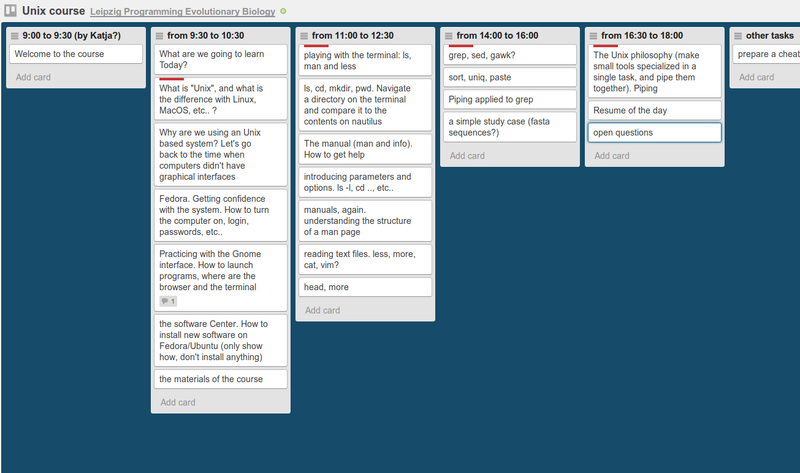 Never thought of using Trello for giving a workshop, i might use it for the next one i’m giving! Thanks! Hello Karl!! Of course, I will post the slides on slideshare and on this blog after presenting it in the workshop. So, they will probably be online next week, depending on whether I can find a good internet connection in Leipzig. quite a nice tool you find out there! Seems that they’ve also made a free iPhone/iOS app for that!